I am ridiculously behind in everything. Including wrapping up posts for the Chronicles of Narnia Reading Challenge! 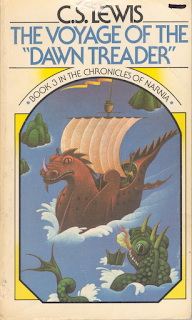 Unfortunately I didn't get the kids started on The Voyage of the Dawn Treader in time to complete the read in July along with the challenge. We wrapped it up about mid-August but at least we finished it, right? The boys enjoyed the whole story and this should be noted as the first book which we have read aloud that Bookworm2 (age 3) has asked me to read to him on a daily basis. "Mommy, I want to read Dawn Treader" came forth from this beautiful boy's lips more than once - which caught me off guard and made me very happy at the same time. I'm not honestly sure what he took away from the story, but I know that he never asks to do things which he does not like doing. Something about the story captured his imagination and although he didn't pay rapt attention when I was read it, he was always very close by occupying himself in a quiet manner. Score! Eustace left the group and ran off to explore Dragon Island all by himself. Those of you familiar with the story know that this ended in an apparent disaster for him but I liked what C.S. Lewis wrote of Eustace at this point. That is so life! The hard times come and we go through changes that we find to be unpleasant. We have a situation which requires more of us than we'd like to give. Perhaps we have to endure a conflict with a friend or a relative that we'd rather have avoided or are working to eat healthier when we'd rather not. Our life journey's are not supposed to be easy or pleasant (despite what we'd like to believe). Looking back on hard moments though, it's easier to see how God uses conflict to make us more like Him. He uses those rough moments in life, those things we deem unpleasant, to change who we are and grow is in the faith. Do not fear the hard times! They have a great purpose! Eustace had left the group in order to a.) avoid work and b.) explore the island and c.) rest in a manner he found worthy. When he turned up missing, various individuals reacted to his disappearance in different ways. "Confound the fellow," said Edmund. "What on earth did he want to slink away like this for? "But we must do something," said Lucy. "He may have got lost, or fallen into a hole, or been captured by savages." "Or killed by wild beasts," said Drinian. "And a good riddance if he has, I say," muttered Rhince. "Master Rhince," said Reepicheep, "you never spoke a word that became you less. The create is no friend of mine but he is of the Queen's blood, and while he is one of our fellowship it concerns our honor to find him and to avenge him if he be dead." Now, at this point in the story, Eustace did not believe in Aslan, but he was on Aslan's mission whether he liked it or not. He was a member of the Narnian party and, as Reepicheep pointed out, that made him eligible for their protection and concern. How often are we tempted to slam our fellow believers because they differ from us in their opinions about what one should wear, what music they should listen to and what not? How easy is it for us to enter into gossip over someone that we don't exactly see eye-to-eye with? When our fellow Christian is attacked unjustly, do we consider it a matter of honor to rise up and defend him or her, or do we just stand silently by hoping that no one will notice our presence or will require something of us? "Well, that doesn't involve me." "They got themselves into this mess and they can jolly well get themselves out of it!" Involving yourself in the defense of another might be considered unpleasant and maybe it's not as fun as an amusement park ride. However, if your fellow brother or sister in Christ has fallen down in some way, the honorable thing to do is get your hands a little dirty and help them back up. Refuse to speak ill of them. Refuse to let others speak ill of then in your presence. Defend what is honorable, true and right - regardless of what it is going to cost you. And yes, it may cost you something. This is getting a little long so I'll wrap it up by saying that we thoroughly enjoyed the read. As I re-read The Silver Chair in July (linked to my thoughts) I'm looking forward to taking my boys on the next adventure here shortly. I don't think we'll need to wait until next July to get to it - but we'll see how things go! So glad the boys are enjoying it! I think there is plenty of adventure there for boys, and plenty of great truths and analogies, too. You brought out some good points I hadn't thought of, like defending and helping Eustace (and other believers). I esp loved your highlighting of how Eustace had been changed by his new life 'little as he suspected it'. As much as I'd love to live a life of ease and skip the difficulties I want to be changed too much!! Ah, this one is such a pleasure to read aloud! My girls loved it, too. And doesn't it have the best first line?!?! I fell in love with Reepicheep in this book.